Over the last week Royal Dutch Shell has faced stiff public opposition in Seattle to it's Arctic oil exploration program with the arrival of the Noble Explorer and Polar Pioneer drill rigs for maintenance and provisioning in Seattle. The Noble Discoverer arrived in the Port of Everett last Tuesday (12 May). 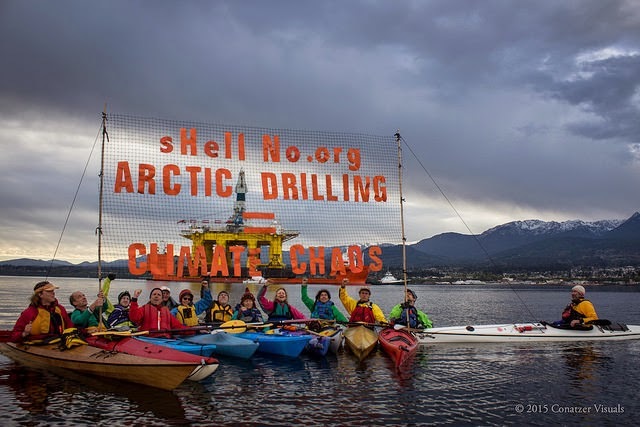 It was met by half a dozen kayaktivists with a sign that said "Shell No". Last week protesters at the Port of Seattle setup a tripod at Terminal 5 to voice their opposition to the Polar Pioneer drill ship, which had been parked at Port Angeles but arrived in Seattle on Thursday. A handful of kayaktivists met the Polar Pioneer on the waters of Elliot Bay on Thursday when it arrived. Shell wants to use the Port of Seattle as it's base to refuel, re-provision and carry out maintenance on it's Arctic drill rigs. But even the Seattle City Council has declared it's opposition to Shell's plans. The City of Seattle Council adopted a unanimous resolution on May 11 urging reconsideration of Port of Seattle lease arrangements for Terminal 5 to host Shell Oil's Arctic drilling rigs. Mover of the motion, Councillor Mike O'Brien said "Maintaining a healthy working waterfront and maritime economy are essential for Seattle's long-term success. But we can achieve that without contributing to the catastrophic and irreversible impacts to our climate that Arctic drilling represents,"
The city's planning department ruled that the port's leasing of a terminal to Shell was in violation of its city permit. Seattle Mayor Ed Murray issued a statement after a meeting of the Port of Seattle Commission on 12 May: "I commend the Port Commission for deciding that the arrival of an off-shore drilling rig should be delayed until the proper permits are in place. I now hope Shell will respect the wishes of the Port, the City and the community at large, and not bring an off-shore drilling rig into Elliott Bay." Shell has ignored the opposition and continued with it's plans to harbour and provision the rigs in Seattle until mid-summer, when they are expected to sail to the Arctic. A further kayaktivist protest occurred on Saturday with over 500 hundred kayaking and other water-bourne craft protesting the Polar Pioneer drilling rig at Terminal 5. Shell hopes to do exploratory oil drilling in the Arctic, in the Chukchi Sea this northern summer, despite warnings that exploitation of Arctic oil endangers the climate, and the severe problems with cleaning up oil spills in arctic waters. Our results suggest that, globally, a third of oil reserves, half of gas reserves and over 80 per cent of current coal reserves should remain unused from 2010 to 2050 in order to meet the target of 2 °C. We show that development of resources in the Arctic and any increase in unconventional oil production are incommensurate with efforts to limit average global warming to 2 °C. Our results show that policy makers’ instincts to exploit rapidly and completely their territorial fossil fuels are, in aggregate, inconsistent with their commitments to this temperature limit. Implementation of this policy commitment would also render unnecessary continued substantial expenditure on fossil fuel exploration, because any new discoveries could not lead to increased aggregate production. In December 2012 Shell's Kulluk drilling rig ran aground near Kodiak Island, Alaska highlighting the dangers moving such drilling rigs. It was being moved from Alaska to Seattle to avoid paying $6 million in taxes. Shell's recent record isn't much better. According to Vice News report a routine coast guard inspection of the Noble Discoverer found malfunctioning anti-pollution machinery aboard the rig last month. On Monday 18th May, over five hundred people blockaded Port of Seattle Terminal 5 where the Polar Pioneer is docked. Protestors started gathering before 7am before marching to blockade the terminal front gate.